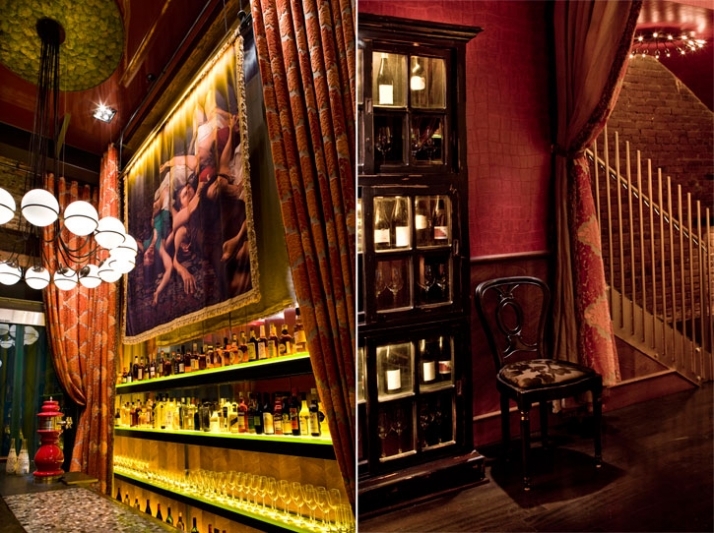 From the creators of Vanity club in Las Vegas comes a unique experience in the heart of San Francisco, Gitane. Mr. 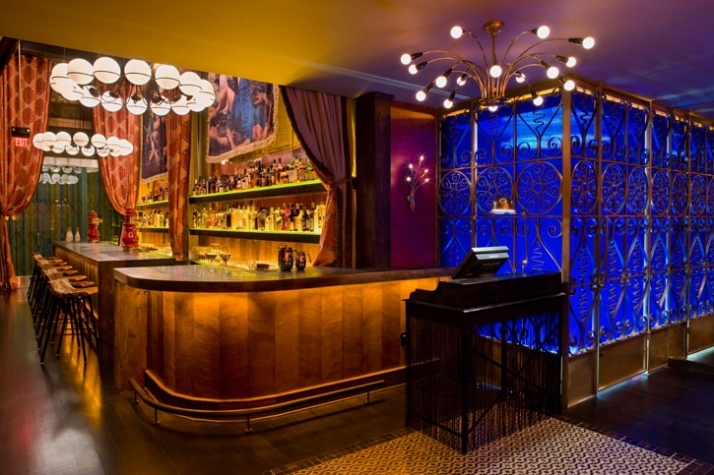 Important, the San Francisco based Interior Design firm specializing in creating indelible restaurant, nightclub, retail and nightlife experiences delights us with a take on history, art, language and diverse experiences from the gypsy culture. The word Gypsy derives from Egyptian, similarly to the Spanish Gitano or the French Gitan. It was a name given to those who came from a far away land as nomads or to describe someone as exotic. To be gypsy is to be a member of an ethnic minority that is difficult to define. This patchwork of groups can be best described and identified by attitudes, behaviors and culture. Whether the origins are believed to have come from Asia or Africa, they all possess a sense of exoticism, mysticism and diversity. 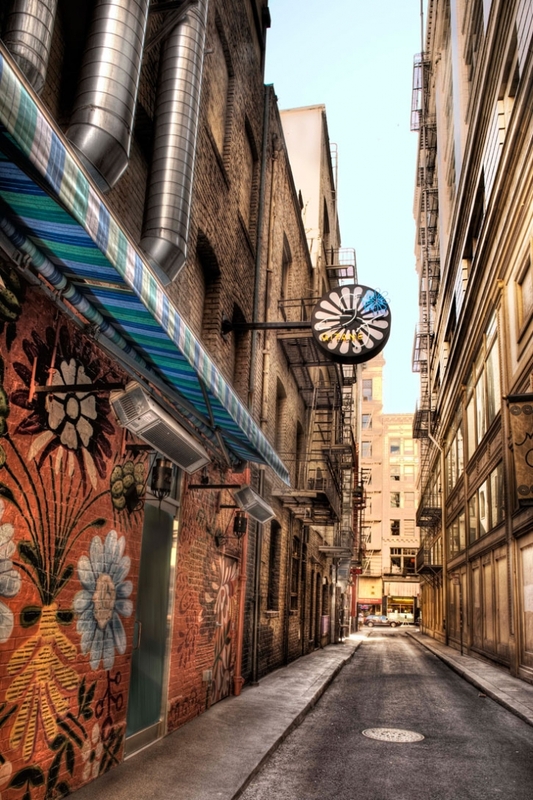 This mixture of elements and regions was the concept behind the Gitane restaurant in San Francisco. 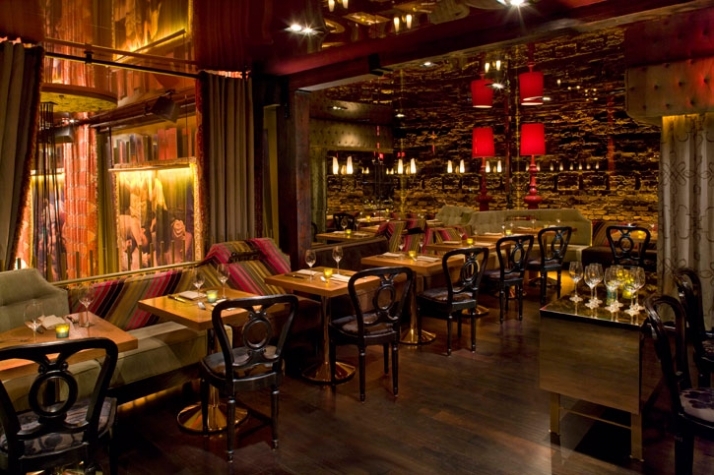 Appropriately located on city street off the beaten path, its eclectic and unorthodox presence accentuate its arrival. Designed by Mr. 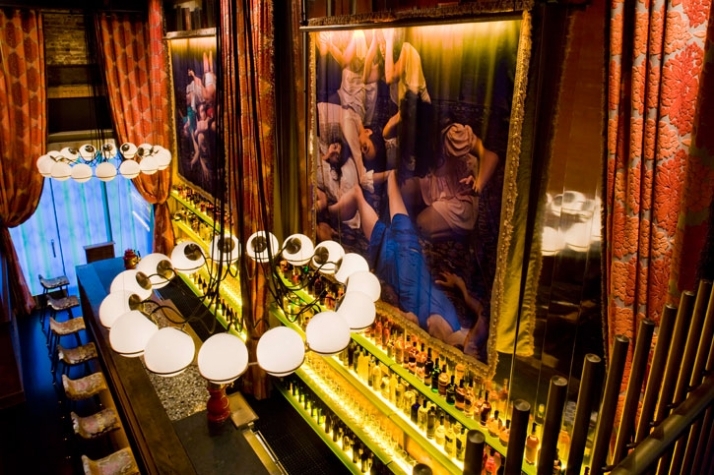 Important, Gitane surely delivers the story of three decades through an extensive palette of color, textures and objects that narrate the complexity of the gypsy culture, music and gastronomic composition. Mr. 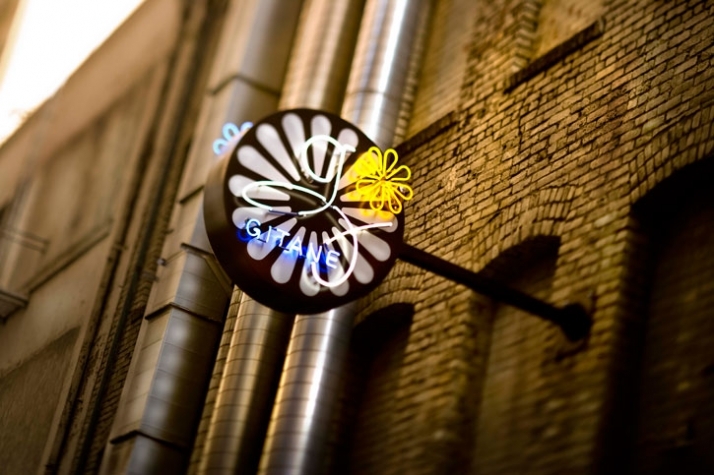 Important clearly begins the Gitane experience on the exterior; unfolding clues to what may lie inside, the side lollypop neon sign displays a layering of funky presence to its identity. 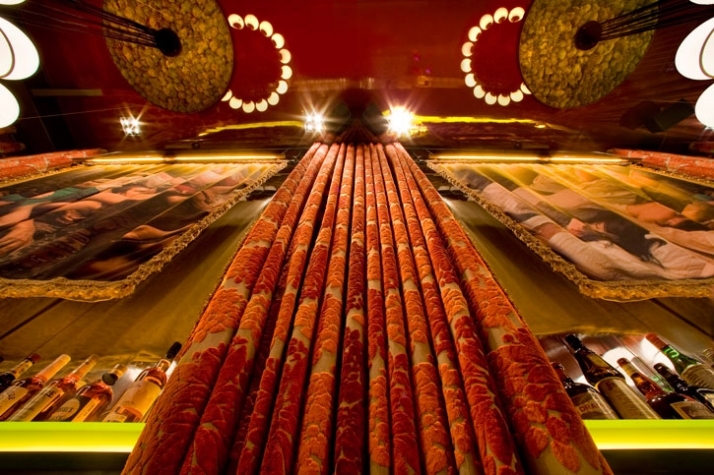 The restaurant's facade sets up the artistic experience you are about to experience. Architecturally, Gitane opens up into an exploration of the Basque region, drawing inspiration to a carefully crafted menu capturing three separate decades - the 50's, 60's and 70's. 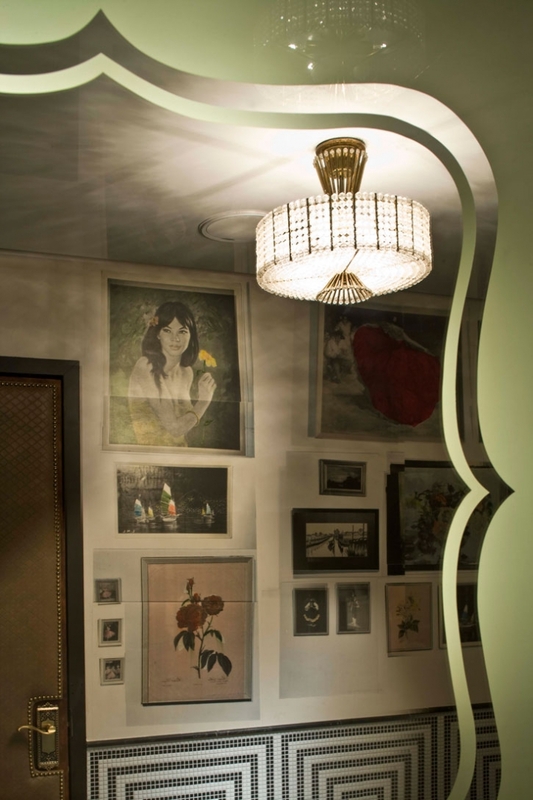 Drawing from Gypsies historical accounts, the interior layers an array of intricate fabrics, hand printed wallpapers, vintage chandeliers and antique artifacts. Mr. Important carefully constructs an "ordered" chaos atmosphere that touches upon a more nostalgic and romantic era rather than rebellious behavior as Gypsies are perceived; this passion and intensity to the gypsy culture is evident in many different ways, perhaps to speak of the diversity of this migratory groups and the collection of art and objects from all over the world in order to compose this funky, modern and richly flavorful atmosphere. 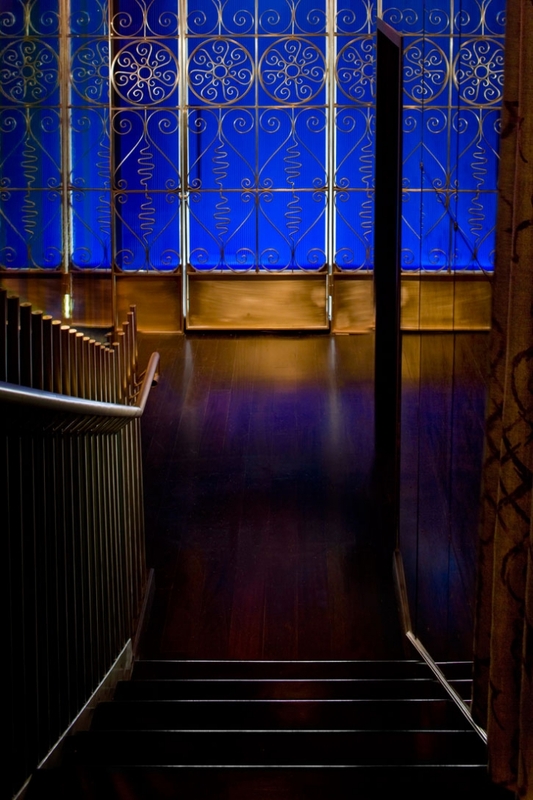 The interior is filled with ornamentation and texture as a warm and inviting backdrop to patrons. 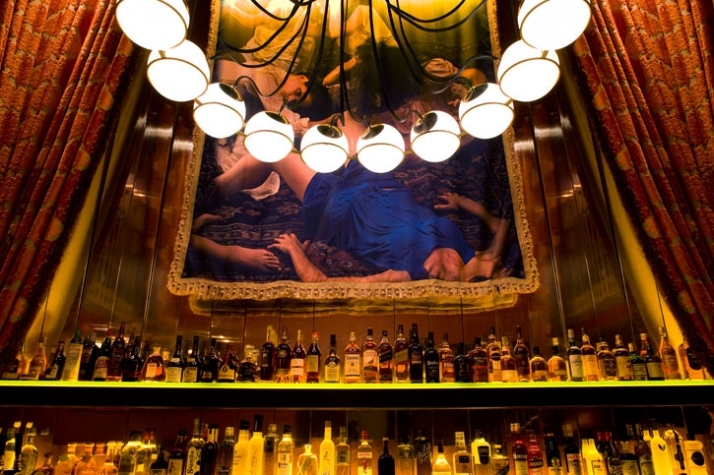 Large tapestries are hung at the back wall of the bar; this, in addition to the large room-dividing draperies, softens the ambiance while simultaneously functioning to absorb the often loud dinner crowd. 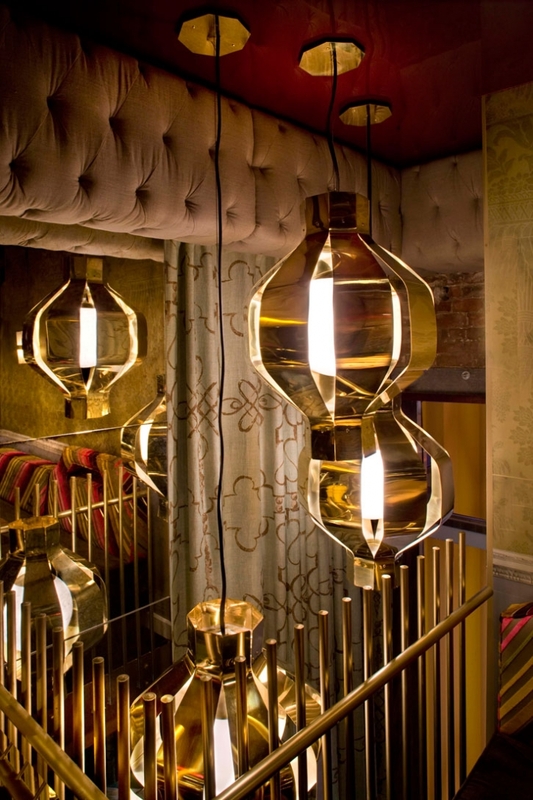 The restaurant's success of excessive texture, movement and ornamentation is extraordinary; soaring high above the dinner table, your eye follows the gathered fabric resting against the shiny planks of metal. The dining area is inviting as its lowered ceiling, soft fabrics and warm stone walls form an intimate dining experience. A wide variety of seating options allow for a formal dinner table setting juxtaposed next to a lounge relaxation experience in the posh banquette seating trimmed with bold stripes and sage tufted velvet. Vivid light fixtures are sprinkled throughout the space providing interest as they serve their purpose to functionally light the space. 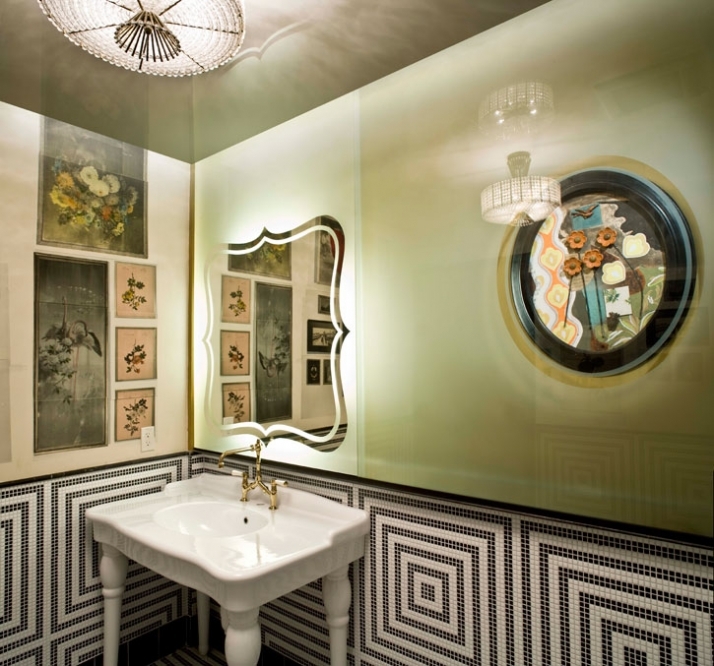 Large spans of mirrors add another dimension to the interior. 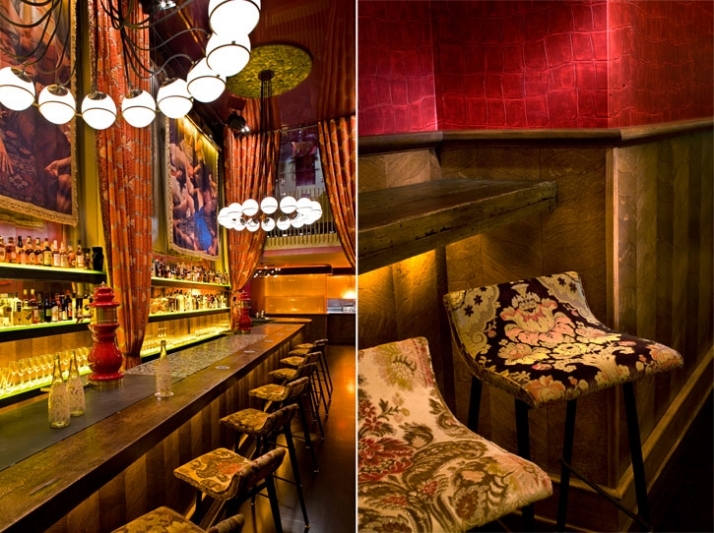 There's a strong dichotomy between the shiny surfaces against the heavy textured brick, the soft cushioned seating against the heavy victorian ornamentation and the layering of bold, rich colors as they play against the monochromatic washrooms. This was no easy feat; the ability to layer such contrasting decades, textures and materials is a huge success and something we'll always be talking about. "I would start with Chiprones - grilled monterey squid, stuffed with hot chorizo, garlic, thyme, onion, rice, olives, lemon dressing, fried bell pepper. // Caille- tolenas farm quail stuffed with chicken mousseline, raisins, shallots, port demi-glace, truffle oil, bed of spinach . // A side of Lentilles - french lentils, bilbao chorizo, sofrit." I don't get to eat this often so excuse me for my indulgence to so much food but if I could try all of it I would. The menu and interiors are so eclectic and interesting that I would order a dish and move from table to table if I could, in order to experience this masterfully layered work by Mr. Important. Gitane surely delivers a unique and nomadic experience every time you come back as the experience changes depending on where you sit. As your eyes gaze over walls, art, sculptures and the people, be sure to look closely to the richness and textures that encapsulate this complex yet seamless environment. A must visit if in San Francisco.